What are ENERGY STAR gas furnaces? It is not uncommon to find new homes with improperly sized and poorly installed heating equipment that can cause uneven temperatures, noisy operation and increased maintenance cost for the owner. An ENERGY STAR® certified forced-air furnace is a popular choice in areas with gas service, heating your home quickly while delivering enhanced comfort and cost savings. 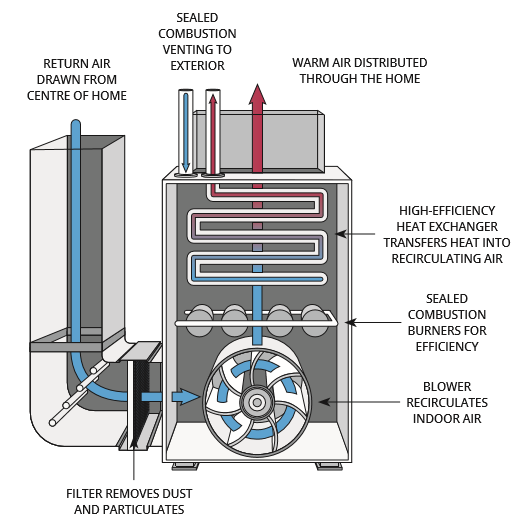 A high-efficiency furnace provides heat by burning natural gas to generate warm air that is distributed throughout your home through ductwork and vents connected to each room. Modern gas furnaces protect indoor air quality by using sealed combustion to isolate the burner and flue from the indoor air and by circulating the air in your home through an air filter.